My personal experiences in several African countries left me with indelible memories of the women and their plights. Through my association with the Stephen Lewis Foundation, I have attempted to 'help' them with their life, survival and grief. In this painting I am trying to show what children feel without the parent, alone, anxious. What is left behind in the void is filled by the wisdom of an older, caring generation who takes up the banner. The grandparent steps in to feed, nurture, and love these children who will be the future. As a parent I felt gratified when my children established themselves in their life choices and therefore I had "no more worries". As a grandmother I realize that the worries do not stop but carry on in a very special way. The grandchildren are even more inspirational and one can see the future beyond the 'me'. In Canada, we know of the 'sandwich' generation - adults who are caring for aging parents and for offspring alike. In Africa, they know of its antithesis - where children are missing their parents and parents are missing their children. It's Africa's missing generation. When asked to participate in this project, I really had not considered the issue that many African families are faced with on a daily basis. As a mother of a 16 year old I just can’t imagine what it would be like to be in the situation these families are finding themselves in every day. The devastation is unimaginable to those of us in the west. We are so blessed to live where we live. As an artist I felt I might be able to make a small contribution through sculpture. It has always been a goal of mine to find and express the common thread that ties us together as human beings. Here, I believe the common thread is our children. To be present for them is truly a blessing. A blessing I know I have taken for granted. I am grateful for the opportunity to participate in this project; It has given me a better appreciation for my family and my life. One of the inspirational videos for this exhibit mentioned the grandmothers being a wall of protection against the ravages of HIV/AIDS. The inspiration for this piece was born at that instant. The imprint of the wall in this piece is also printed on the dresses of the grandmothers...to integrate them so that they become the wall. Even their stance is designed to convey courage and determination. I am paying homage and celebrating the generosity and humanity of these gogos. I have always had an interest in art and, in the last couple of years, discovered a way of blending together three mediums that I love. Hence my designs feature wood, acrylic paint and batik fabric. One day I was looking for subject matter and I picked up a copy of the Stephen Lewis Foundation’s Grassroots magazine. 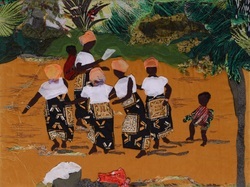 I thought "oooo...I could do a picture representing these amazing grandmothers" and my piece "Africa's Hope" was born....inspired by the indomitable women of African and by my deep commitment to the Grandmothers to Grandmothers Campaign. I was born and lived in South Africa for 38 years, throughout most of the Apartheid years. We emigrated to the United Kingdom in 1986, as both our sons would have been eligible for National Army Service after school. Although I have been here for the past 27 years, and London is now my home- my heart remains in Africa, under a baobab tree on the wide open veld surrounded by wonderful wild animals. I want to draw attention to the importance of community cooperation in maintaining traditions and cultural ties. I wanted to capture the scope of the Grandmother connection. While all children deserve to grow in a loving, safe and secure environment, not all children do. "Pearls of Wisdom" reflects that love and security all children need. This grandmother, enjoying the embrace of this young child, knows he lives in a secure and healthy family. The African grandmothers, while grieving the loss of their own children, are working to provide that security for their grandchildren. 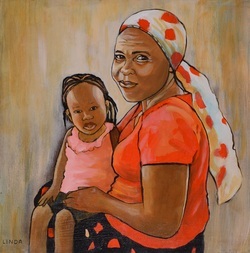 This painting represents the strong connection of love between grandparent and grandchild and reflects the compassion shared by all grandmothers. I hope the sale of this painting will assist them in their struggle. "Nanna Knits the World All Better"
This painting was inspired by the Grandmother movement. My mother is a Gogo and has devoted a lot of time and effort to organizing and working at fundraising events and producing various type of fabric arts for Gogo sales. Life on Earth is all about connections. Like something made with yarn, we're knitted together. It's an inspiration whenever a group of people, strangers, step up to help out another group of people on the other side of the world. The work of all the grandmothers and grandothers make the world a better place. I wanted to show the regal beauty of African Women. I identify strongly with the African grandmothers in their grief for their children lost to AIDS. My commitment to the ongoing work of the Stephen Lewis Foundation has been personally rewarding and I am grateful for this opportunity to offer "Hope for a Child" to further the cause of African women and children. "Hope in the Eyes of Our Future"
I took this photo and was impressed with the mother’s love and admiration for her child. There is hope in the love and care of the future generation. I was born in Africa and feel a deep bond with its people, especially women. The photo showing this woman’s smile, her colourful clothing and beads and the name “Happy Grandmother” inspired me. The space between her teeth is considered good luck. The Maasai live in villages - a village is a household of relatives and neighbours and any child of the village may be the responsibility of any adult. I love portraying Africa’s people, landscapes, seascapes and culture in my paintings. I am a grandmother and the opportunity to contribute to this exhibition is a great motivation for me. The woman in the painting is Mrs. J, First Wife of the Chief of the village and one of her grandchildren. Mrs. J appeared to me to be a very proud strong resilient woman who was trying to keep her family strong in the face of many odds. I hope I have been able to show this in the painting. I was moved to participate because I believe in the good work the Stephen Lewis Foundation is doing and women like Mrs. J need and deserve all the help that they can get. My family and I were all born in Africa. I have deep bonds with Africa, its people and especially with its hardworking women. I loved the contentment” in the photo of this young mother. A large joint family system is a way of life in East Africa. Even if people are just neighbours, they are considered part of the family circle. Sisterhood fits this painting because a child born into such a household becomes the responsibility of all around. The young mother has many well wishers and many "sisters" to help raise the children. I have always loved to make things. Over the years, I drifted away from creating as family and work took more of my time. In 2011, after joining the Royal City Gogos, I once again found an outlet for my creative abilities. I particularly love working on the AIDS angels because each one represents an African child who has died of AIDS. Each one is unique and they inspired me to want to work on larger fabric figures. With the grandmother and grandchild figures, I wanted to show how they are joined in both grief and joy and are able to move forward together. 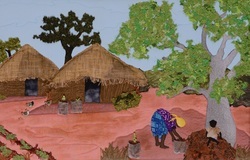 Having travelled in Africa, I am so inspired by the grandmothers there. They are the warriors on the front line of the battle against AIDS and I am so proud to be part of their support system. I choose steel for the grandmother's hand. It represents strength, reliability, adaptability and security are a few of these shared qualities. Age was another factor in my choice of steel to represent the grandmother’s hand. Iron ore that is used to make steel was formed when Mother Earth was born. I choose wood to carve the child's hand because I feel it symbolizes the fragility and vulnerability of youth, in need of nurturing and love. Much like a young sapling, a child requires care and protection so it can thrive throughout many generations. Two different hands gently clasped, yet bound together firmly by love. I wanted to enter this event to introduce the work of the Stephen Lewis Foundation and the Gogos to people who otherwise may not know about them. In 1966 my husband took a job in Accra, Ghana and we were there until 1969. The people were the most cheerful and friendly I have ever met. As an artist I was overwhelmed by their beauty and all the colours. Ghana left such an impression that I still use these subjects today. "Joy and Celebration of Resilience through Adversity"
Red for Resilience, the power to pursue. Black for the Culture, all they are and all they do. Silver for the lining when the feelings are numb. White for the Angels that guide to overcome. Texture for the Depths one must reach deep within. Colours enmeshed display their Dance when they win. 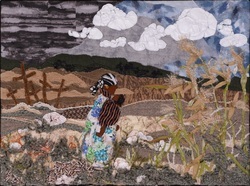 This quilt is a sequel to one of my earlier pieces, Caring for One Another, which was inspired by stories of the many child-headed households in Africa. It is heartwarming to hear how communities are coming together to embrace and support these children so that they can remain in school and maintain possession of their family homes. As her face emerged from the bits of fabric I thought about how this love and support allows these children to have moments of respite when they can just be kids again. The piece really came alive when a good friend generously donated some of her favourite hand-dyed fabric for the background. Our cultural histories have contributed to who we are today. African nations are evolving as are other nations all over the world. 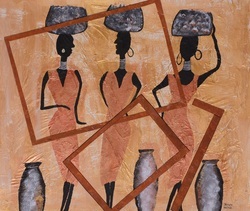 The Face of Africa is an intuitive semi-abstract acrylic painting depicting the cultural roots of African women today. I was born and grew up in Zambia, Central Africa. I studied medicine at the University of Cape Town and subsequently practiced as a family physician in Burnaby. 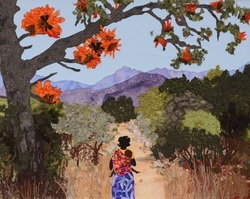 I have deep roots and a strong connection to Africa and, with an acute awareness of the grandmothers' struggles, have been a member of the Coquitlam Gogos since 2006. My sculptural work is inspired by the naturally-occurring proportions, lines and structures I find in nature, and in this piece, the aesthetics of traditional African sculpture. I admire African grandmothers for their courage and resourcefulness. Across 15 countries in sub Saharan Africa, it is the women, the grandmothers, who are restoring hope and rebuilding their communities. This work is a celebration of their diversity and their determination. When I received the link to this wonderful exhibition, I was very moved, not only by the fact that I am now a grandmother myself, or that I am African in my heart and soul, but by the stark reality of what AIDS has done to these people. Your exhibition helps me to show my feelings, empathy and love of all African women. I am thrilled to be submitting my art to this exhibition, as the Stephen Lewis foundation is very close to my heart ---being an African Gogo myself. So many tears shed by so many heartbroken grandmothers. And yet they still are able to move on in hope for the future of their grandchildren and their communities. Their tears now are tears of joy filled with hope, love and compassion. The crystal beads surrounding and forming the teardrop represent those many, many tears. The grandmother, caressing her grandchild, now cries tears of hope, knowing their future will be brighter. The symbols on this piece are for Hope, Protection and Remembering the Past (so that it does not continue as before). My intention was to depict the triumph of the African people over the many almost overwhelming obstacles placed upon them. I was profoundly moved by a photo of crosses against a desolate sky; and then again moved by the determination and resilience of grandmothers and children moving onward in their lives. I placed crosses representing death by AIDS and a dark, foreboding sky in one far corner. The grandmother with child clinging to her is moving forward and away from darkness on a path through sticks and rocks towards a lightening sky. The crop of tall, growing corn bursting with life. I fell in love with this beautiful art form during two previous exhibits on Vancouver Island and was moved by the power of art to tell stories and stir emotion. With strong encouragement from Maria Box and Gillian Farrow, I undertook the creation of this piece with guidance at every step. It is another expression of the sisterhood that we are blessed with as members of the Grandmother to Grandmother campaign. The Moringa tree is called the “Miracle” tree for good reason! It can be a means of combating poverty and malnutrition. It grows quickly in a variety of environments and is considered a superfood as much of the plant is edible. While we often feel powerless as individuals, the Stephen Lewis Foundation gives us an opportunity to contribute and feel strength in the unity of a sisterhood with grandmothers in Africa. I wanted to inspire conversation and thought about people in Africa. "Love Letters in the Sand"
This little girl has her grandmother to love her and look after her. With the help of the Stephen Lewis Foundation, she is able to go to school. So on a lovely day she is proudly showing her “Gogo” the letters she has learned at school. Gogo is the word for grandmother. I have been inspired by the previous textile art shows that the Comox Valley grandmothers have organized. The awareness and emotions that they have evoked for the plight of the African grandmothers have been tremendous. I wanted to be part of this. This work is based on a photograph by Alexis MacDonald, SLF staff. 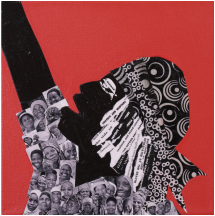 This woman represents the thousands of women who raised their arms in a march in Manzini Swaziland on May 8, 2010. Her hair is a collage of strips from the Manzini Statement in which African grandmothers demand their governments end violence against them, ensure meaningful support and their protection and rights under the law. She is an African woman. She is an agent of change. On March 7, 2008 Swaziland Positive Living (SWAPOL) and the SLF brought together Swaziland grandmothers and 12 Canadian grandmothers for a workshop and march. In 2010, the SLF and SWAPOL brought 500 African grandmothers from 14 countries to Manzini, Swaziland. They marched in the thousands, grandmothers from Ethiopia, gogos from South Africa, nya nyas from Kenya, sho shos from Zambia, nanas from Namibia, marching in solidarity through Manzini, Swaziland, in the first-ever International Grandmothers' Gathering on African soil. Striding alongside them were 42 Canadian grandmothers, members of the Grandmothers to Grandmothers Campaign. Activism was ignited in Africa. African grandmothers vowed to forge a vibrant future for their grandchildren. Canadian grandmothers vowed to be with them every step of the way. I am inspired to show African women in many joyful ways, laughing, dancing and being joyous, for such is the African heart and soul. They bury their pain and show us only their sheer exuberation in all aspects of life. They have an unswerving optimism and their families are of the utmost importance to them, above all else. I was inspired to get involved and be a part of a helping hand to offer hope through an Angel for AIDS group as well as Glacier Grannies. This has allowed me to express myself through the arts and assist others with gaining hope and peace.